This is a Guest Post by Miguel Chavez, visit also his Blog modernidadyobsolescencia.blogspot.com. Miguel, thanks for this thoughtful entry. Are you interested in sharing fascination and writing your own Guest Post? See this link. 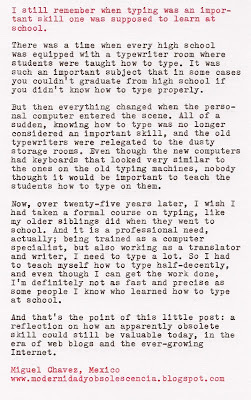 Hello Miguel, this reminds me of my own typing class in highschool - I was the last generation to take one, but it provided me with a 10finger system of typing which proves very helpful right now, and every day. Great idea of this guest post! Thank you Florian. Very nice post. I agree 100%. Two skills that schools do not teach proper penmanship (printed and cursive writing) and typing. A third could be added for those college bound; shorthand. 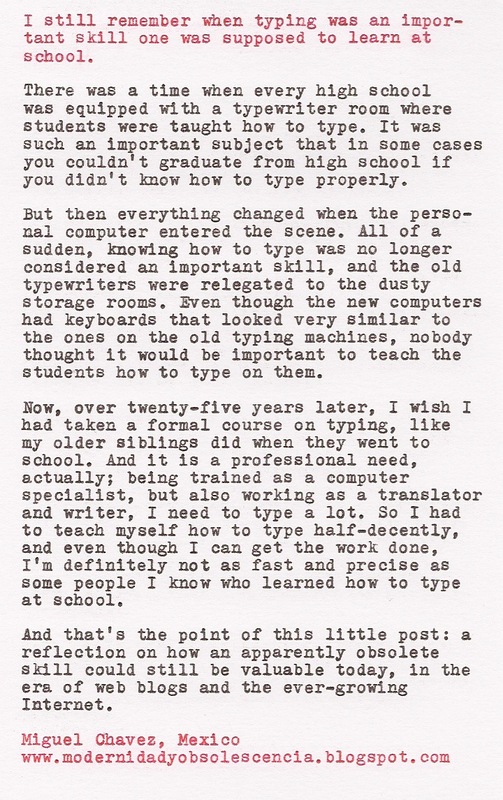 I learned to type in high school and was not interested to take shorthand as an elective class. Then I went to college. Beautiful Smith-Corona typewriter. I wish my desk were so neat and orderly. Very true! I took typing in 8th or 9th grade but could have used a refresher course before college. I now typically use about 4 or 5 fingers when I type and could be much more efficient if I had kept up the 10-finger method I learned over 30 years ago. Very well said! And I totally agree... With computers we all think we know how to type properly. But we don't. I do believe most of us don't use our 10 fingers to type. I still remember the nostalgia with some of my older friends and family looked at my typewriters when I have started collecting them. Apparently they had all learned to work with them when they were at school!